Michie Sushi is fast proving to be very popular with Dubliners these days and in the last 6 months, we have seen them expanding with two new branches, one in the South Beacon Centre in Sandyford and the latest in Avoca Store, Rathcoole.I was happy to see them opening in Sandyford, for while I am a big fan of Sushi, I have always found their place in Ranelagh a bit too small and cramped. 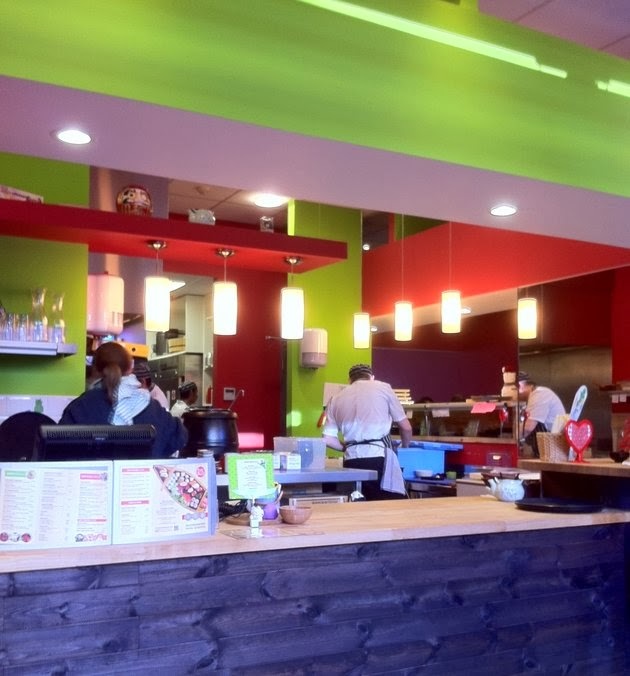 The place in Sandyford, is far from what you would call," spacious" but it is bright, airy and the space has been well put to use.With tables,well spaced out, there is ample room to eat comfortably and there is also additional seating at the bar counter while observing the Chefs at work. Sushi variety arises from different fillings, toppings, condiments and preparation as well as presentation which vary widely. 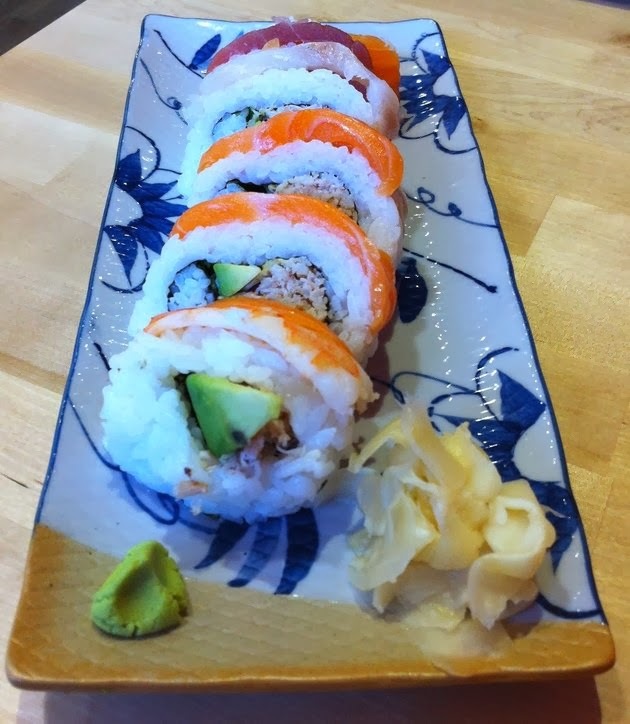 Michie Sushi has a comprehensive menu, from hand made sushi to order, they also offer a selection of hot Japanese dishes and there's complimentary Green tea while you wait. From a 6 pcs Nigiri sets @€10.50,an oblong hand pressed mound of sushi rice with a topping draped over it to the Maki roll 6 pcs set @€9.95, a cylindrical rolled sushi rice and filling wrapped in toasted seaweed,Miso Ramen noodles soup @ €11.22 ( Yes, €11.22 , I couldn't understand that at all !!!! or Mochi for dessert @ €3.41 ) to Yakisoba noodles @ €9.50. However there is plenty of choice for every taste and budget, down to the last cent literally!! 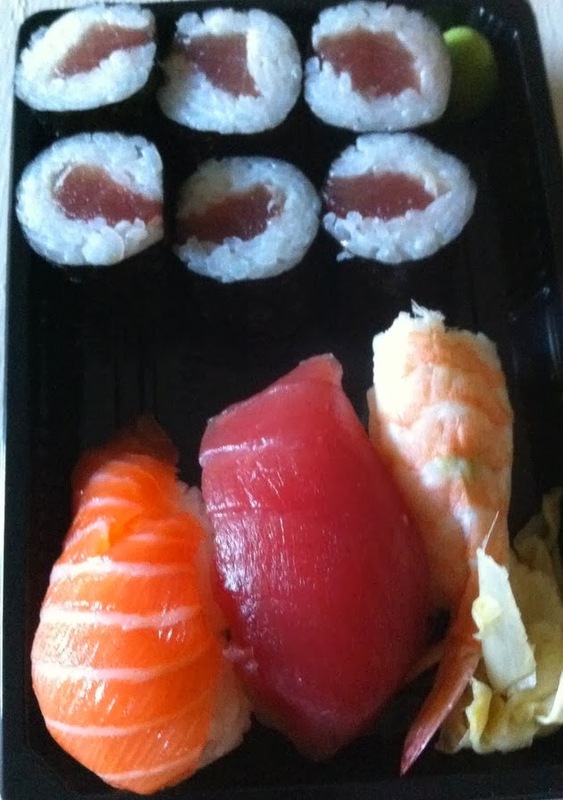 I opted for the small set, great value @€8.95, as this consisted of one pc each of Salmon, Prawn & Tuna Nigiri and 6 pcs of Tuna Maki roll. The common ingredients all Sushi have, is the Vinegared rice, here it was very well seasoned , sweet and salty at the same time and moist. The fish were firm,fresh, all with the right colour and tenderness.Delicious. The perfect kind of food if you are trying to look after your waist-line, as Sushi is naturally low in fat, high in Protein, carbohydrates,vitamins and minerals. 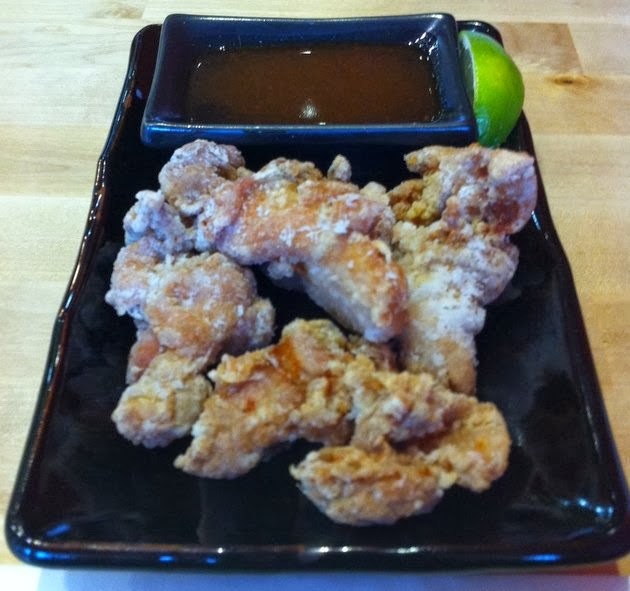 I was happy to see Tori Karaage @ €6.90 on the menu, as it is one of my favourite of all times. Karaage being the Japanese version of fried chicken, a technique in which various foods, most often chicken are marinated in soy & ginger, coated in potato starch and deep-fried. The chicken pieces were juicy, yet very crispy on the outside. With a sesame chilli soy sauce, to dip the succulent fried chicken in and a squirt of lime juice, it was the perfect balance between flavour, texture and richness. 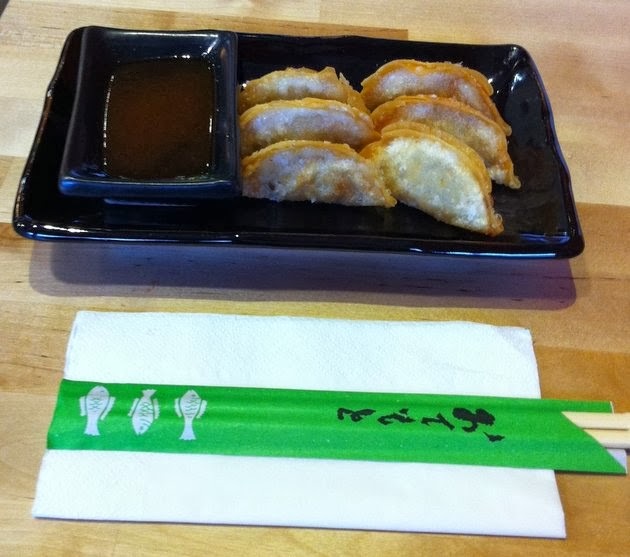 The Vegetable Gyoza @€5.90, a type of dumplings, served steamed or fried along with it's dipping sauce were very inviting on their minimalist black Japanese style dish. I usually like them steamed but this time , I chose to have the fried version.The horn shaped dumplings had a light and crispy casing and on the first bite, the filling was flavoursome with a rich garlicky/ spring onion taste . They were very tasty but I did find them a bit on the dry side compared to the steamed version , which are usually very juicy. But a good dip in the accompanying sauce helped to re balance that out. 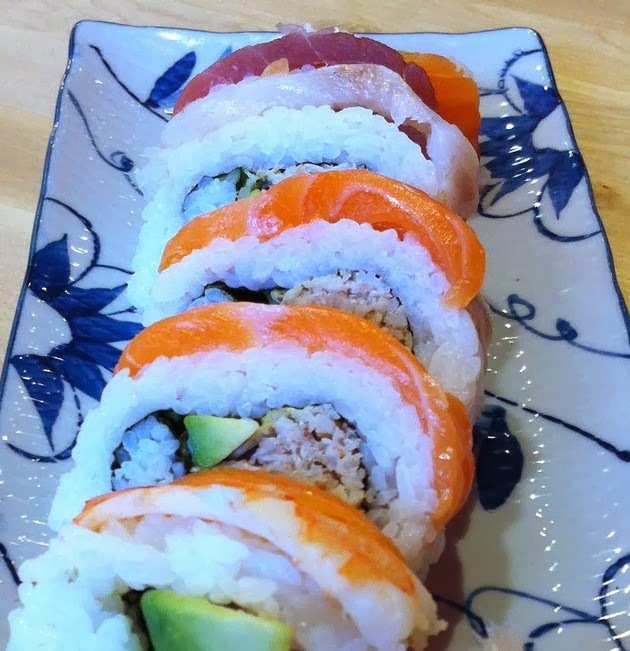 The Rainbow Roll @ €14.90, was an inside-out Californian roll with a centre of crab meat and avocado, wrapped with a Sashimi of salmon,tuna,sea bass,prawn and eel. Very attractive and inviting it looked on it's patterned ceramic Japanese style dish but it was enormous. It was much more than a mouthful and impossible to manoeuvre with chop stick and that says a lot as I am fairly good at using chop sticks. It was far too big, hence very awkward to eat. I had to ask the waitress to pack it up for me to take home. But from the piece that I ate, the crab meat was well seasoned, and the various seafood fresh and firm. The staff were very friendly and service was prompt. However, despite asking for the dishes to arrive in succession, they all arrived at the same time. All in all, it was a delicious and very tasty meal with the exception of the rainbow roll that I didn't enjoy at all, not the taste but the sheer size of it. Branches also in Ranelagh, Dun Laoghaire and Avoca Rathcoole. Great to read a review Robert, I'm a big fan of Japanese food and had seen Michie and wondered what it was like, I'll have to try it. But I think I might give the rainbow roll a miss ! It was a bit on the big side , I couldn't eat in without making a mess hence took it home to eat later on.